When asked, how I practice the guitar, I tell people that the secret is to practice a little each day. The hardest part is staying motivated and focused. Practice is all about putting the work in now so you can play anything later! Every practice session should add to your repertoire or skills. This article will tell you everything you need to unleash your inner guitar hero. Consistent practice is the most important success factor because your body and brain need to make the movements second-nature. It is exactly like learning to walk, learning to drive, or learning to throw a baseball. You need to practice regularly to do the movements without thinking. 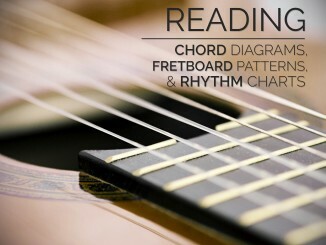 This includes practicing chord grips, strumming, plucking single strings, etc. Practicing one per day is better than once per week. Think of it like studying for an exam. If you only study the night before, you will remember it for a few days then forget it. If you practice daily, you will make small imprints that are easy for your mind and body to remember. I recommend 30 minutes of practice per day, but anything is better than nothing. I also recommend that you make a practice schedule and track the amount of time you spend each day. It will help keep you on task. If you ever read Steven Covey’s The Seven Habits of Highly Successful People, you’d know that he categorizes tasks by importance and urgency. Unsuccessful people have a tendency of prioritizing urgent tasks even when they are not important. Guitar practice is important, but it is rarely urgent. 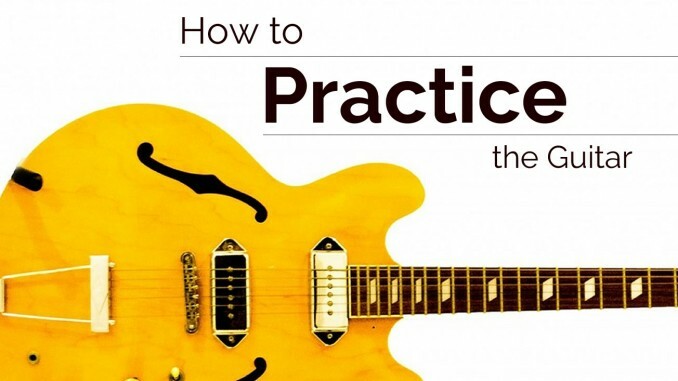 If you want to be successful with the guitar, you should prioritize practicing. If you’re in school, I would recommend practicing after school but before dinner. This worked well for me because I had a 2 hours window and fewer family members to distract me. On days when I had after school activities, I practiced immediately after dinner was cleaned up. I recommend this time for people who are busy after school before dinner. On weekends and other days off, I recommend practicing before lunch. This is usually a great time because it is rarely interrupted by other plans. If you’re in college, I would recommend practicing in the afternoons. Let’s face it, college kids stay up late and sleep in. Then they go to class for the rest of the day. When I was in college, I scheduled my classes early. This gave me time to play the guitar and finish my homework while everyone else was at class. Today, I have one roommate, my wife, and a kid on the way. I learn the best in the morning so I try to play 15 minutes before work and 15-30 minutes after work. On the weekends, I play in the mornings. It works well and it’s easy to schedule with my wife. I don’t have tips for kids yet, but I suspect that the best time is after they’re asleep. I expect to have some more information on this topic in the coming months! If you’re concerned about waking everyone up, I recommend buying gear that lets you use headphones. 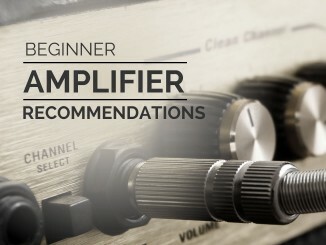 I play through an audio interface using Guitar Rig software, which models guitar amps and effects. Almost all audio interfaces have a headphone jack. This is the perfect way to practice silently. Where Should I to Practice? I recommend finding a secluded place without distractions. Also, make sure the location is easy to get started so you don’t have to set everything up. For example, when I was in college, I could use the music department’s practice rooms. These were perfect rooms, but I had to lug my guitar across campus. The time to travel and setup made daily practice harder. That is why I played in my dorm room, where I only had to open my case and tune the guitar. When I was in high school, I’d practice in my bedroom, but the garage or basement would have worked well. I recommend finding a place that you can setup a music stand and your gear. Remove as many impediments to practicing as possible! Playing outside is enjoyable, but it isn’t routine practice. It’s more like the reward for your practice. Think of the potential issues with being outside. The wind can blow your sheet music away, the sun can be in your eyes, you have to setup or carry your guitar, etc. It may be calm and peaceful, but it is still distracting. For your daily practice routine, I don’t recommend playing outside. Today, I have a home office with my computer and all my guitar gear. It’s a great spot and works well for me. I can start practicing in under a minute. 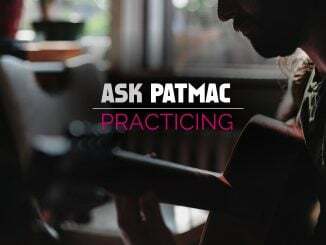 The answer is simply to practice something new or unmastered every day. When you start practicing the guitar, everything is new. You learn a lot because every practice session is breaking new ground, physically and mentally. After a while, most guitarists become less and less efficient with their practice. They repeatedly play the things that they know. They run out of new goals. They believe that playing what they know is practice. I can tell you from personal experience that true practice must be goal-oriented. It must have a specific purpose! I practiced lazily for years. I would “noodle” around by playing a few chords, some songs that I knew, I’d improvise a little, but I wouldn’t advance much. I was in a rut because I didn’t learn what to practice. I don’t want you to make the same mistake. You need to challenge yourself to improve and I want you to do it every day! Determining what to practice is a HUGE topic, but the end result is a list of goals. People who talk about goal setting always talk about creating SMART goals. Specific – You must scope the idea well so you know exactly what you want to achieve. Make sure it is specific enough that you can achieve it in a couple practice sessions. Measureable – You can measure it by being able to play it when you’re done. I recommend recording the result. Achieveable – You want to improve but not get frustrated. Set the bar high but not too high. My rule of thumb is that it should be achievable in less than a week. If not, break it down into smaller, more achievable parts. Relevant – Does this goal help you achieve your larger goals? Does it help you improve? Timely – Give yourself a realistic completion deadline. Challenge yourself to meet it. If not, figure out why and try to tackle that problem. I want to learn __________ by this date ___________. I will be successful when __________. It is achievable because _______________. It is helps me improve because ______________. I want to learn to play the chord changes for Layla by Eric Clapton by December 31st. I will be successful when I can play along with the track through the entire song. It is achievable because I know most of the chords. It helps me improve because I will learn a couple new chords and use them with rhythms that I haven’t played before. Notice that I didn’t add the whole song. The solo could take weeks to learn. It would be frustrating to have one goal last for a month. This is why I recommend goals that are achievable in less than 1 week. Quicker goals are more motivating, and self-motivated guitarists improve the fastest. Every guitarist will have different goals, but I will give you some questions to ask yourself. This is purely a brainstorming section. First, a great guitarist that you want to emulate. What do you like most about that guitarist. What styles is he playing? What songs of his do I like? What parts of that song can I learn now? What techniques is he using? Where can I find sheet music for that song? Where can I find exercises to practice those techniques? To organize your brainstorming session, I recommend creating a mind map. They allow you to relate topics to each other. They’re very useful for organizing your thoughts. Learning what to practice is about creating goals to learn songs, exercises, licks, etc. Learning how to practice is about playing every day, using a metronome, avoiding distractions, being prepared, etc. It is about realizing your goals and ideas. In this section, I am going to share with you my tried and true practice procedure. I created a practice procedure to define what quality practice entails and to simplify the process. Your time is the most important resource for learning. I want you to maximize it! One of the most important steps is to be prepared before your practice time starts. You should attach exactly one goal to each practice session. Don’t tackle more than one goal in a single practice session. Multitasking will distract you. One practice = one goal! Also, I recommend grouping similar goals together each week. Make a weekly plan and stick to it. When it gets derailed, do your best and replan on a weekly basis. Agile software developers use sprints to plan their goals for a set amount of time. I recommend that you create a practice plan for each week so you know exactly which goals you want to achieve this week. This will ensure you accomplish your highest priority goals. When you practice, use a metronome. If you do, it will help you learn everything. Yes, everything! If you don’t use a metronome, you will likely form bad habits, rush things, and struggle. I can’t stress this enough. Use a metronome. Slow it down until you can play something perfectly several times in a row. Speed it up to challenge yourself again until you can play it at the required tempo. To prevent injury, stretch and warm up with a few exercises that stretch your fingers. You may just play a few songs that you know. The key is to get the blood flowing. It will help you play longer today and when you’re older. Know your daily goal in advance. You should have a plan. Get your metronome out – use it as often as you can for practicing. Warm up – play a couple exercises to stretch and loosen your fingers. Practice – We are training your hands and mind to work together on new, unmastered material. You should not be reading up on guitar, you should be playing. This will make sure you are connecting your new material physically and mentally at the same time! Wrap-up – make sure you write down how long you practiced, what you practiced, your successes and what needs to improve. In general, I think it pays to create fun goals. Learning songs can be fun. Some topics are less fun but they make guitar more fun in the long run. The people who learn something new every day stick with the guitar longer. Your motivation will fluctuate over time! It is helpful to ask a friend or family member to hold you accountable. If you miss a day, try to make it up the next day. Just don’t cram it all into one day per week. It doesn’t work that way. Also, don’t forget to log your time and track your progress. Make it a poster! Recording yourself is also a great way to relive how you are progressing. Make it a progress diary. I recommend adding rewards into your practice plan. Reward yourself with a fun session after a big goal is accomplished. Have a weekly concert for your family. Create a competition with a friend who is learning. Plan a day to play together. The guitar is fun. Just make sure you invest in yourself so you can have even more fun later. Practice is all about putting the work in now so you can have fun later! I hope that I gave you a lot of useful information. One of my website’s goals is to inspire because it is so important for guitarists to stay motivated. If you know a way that I can make my site better more inspirational, I’d love to hear it! Until then, practice hard and have fun!